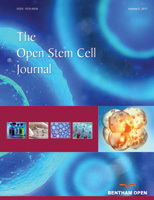 The Open Stem Cell Journal is an open access online journal, which publishes research, reviews, letter articles and guest edited single topic issues, reviews and letters in all areas of biology and at the interface of related disciplines. The core disciplines in biology that are published in the journal are the following: Cell & Developmental Biology; Genetics & Genomics; Molecular Biology; Structural Biology; Bioinformatics; Systems Biology; Immunology; Biochemistry; Ecology; Zoology; Ornithology; Entomology; Marine & aquatic Biology; Plant Biology; Bioethics; Behavioural science ; Microbiology; Reproductive Biology; Glycobiology; Macromolecules; Proteins & Peptides; Theoretical & Mathematical Biology; Evolutionary Biology; Techniques in Biology; Biotechnology, Applied Microbiology, Biodiversity Conservation, Biophysics, Biostatistics, Crystallography of macromolecules., education in biology, Marine & Freshwater Biology, Mathematical & Computational Biology, Mycology, Nanoscience & Nanotechnology, Parasitology, Paleobiology, Astrobiology; Physiology, biopolymers, Soil biology, and Interdisciplinary Applications in biology. This journal publishes open access reviews on recently published books (both print and electronic) relevant to the journal. Publishers and authors of books are invited to contact our book reviews editor at toscj@benthamopen.net with book review requests. All submitted books will be reviewed by an independent expert in the field. No page charges will be levied to authors for the publication of book reviews. Manuscripts for research articles and letters submitted to the journal should be divided into the following sections; however, there can be an extension in the number of sections in review articles in accordance with the requirements of the topic. Alfredson H, Bjur D, Thorsen K, Lorentzon R, Sandstrom P. High intratendinous lactate levels in painful chronic Achilles tendinosis. An investigation using microdialysis technique. J Orthop Res 2002 Sep; 20(5): 934-8. Danielson P, Alfredson H, Forsgren S. Distribution of general (PGP 9.5) and sensory (substance P/CGRP) innervations in the human patellar tendon. Knee Surg Sports Traumatol Arthrosc 2006; 14(2): 125-32. Lozada CJ, Altman RD. Management of osteoarthritis. In: Arthritis and Allied Conditions. Koopman WJ, Ed. Baltimore: Williams and Wilkins 2001. Tsoref L. Joint analysis using ultrasound. United States patent US 7204807. 2007 Apr. All authors must strictly follow the guidelines below for preparing illustrations for publication in The Open Stem Cell Journal. If the figures are found to be sub-standard, then the manuscripts will be rejected. The publication fee for each published letter articles / short communications / case reports submitted is US $750.